Tensions may be rising all over the world, but strained international relations don’t seem able to stop students from venturing abr4oad for both short term and full degree study programs. According to recent statistics from the Institute of International Education, around 800,000 international students attend American colleges and universities each year – and they’re helping to boost the US economy in a variety of ways. International students can help the housing market. Housing for international students near college campuses is a kind of short term rental that keeps on giving – and while student renters may bring their share of headaches, as Jason Hartman says, they’re also likely to bring a landlord/investor a stream of income, especially if there’s an international student placement organization involved. 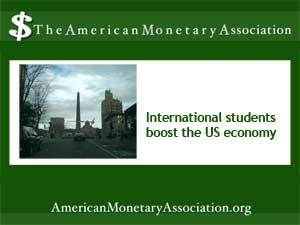 Students boost the economy in other ways too. Some buy cars and other higher end items. Many get jobs, either through sponsored work study or on the general job market. Organizations that serve the international student population provide jobs for professionals such as teachers and counselors. And of course, the travel industry benefits in ways small and large. The nature of the international student population changes, of course, as the global political landscape shifts. Currently the largest group of international students in the US are Chinese, at 25% – a change from past years which saw many more from the wealthier countries of the Middle East and India. Travel restrictions and economic conditions at home also affect the number and nature of students choosing to go abroad for an education. Still, for much of the world, a degree or other certification from an American college carries its own cachet and allows the degree holder to bring home much needed knowledge in fields such as medicine and the sciences.